Bees are a big family with over 20,000 species which includes insects such as honey bees, carpenter bees, stingless bees, cuckoo bees, and many more. However, the most famous bees are surely honey bees and bumble bees. Honey bees are known for honey production, but also for their sting. Bumble bees we mostly only know as fuzzy and bigger honey bees, but they are much more than that. They are some of the best pollinators so it’s essential to protect them. However, sometimes our encounters with them are not pleasant. Bumble bees are usually peaceful but will attack if provoked. A simple answer to ‘do bumble bees sting’ is yes, but there is more to that. Not every sting is the same, and bumble bee sting is different than a sting from a honey bee. A common thing for all bees is that only female bees (queens and workers) have a stinger, and bumble bees are no different. Through this article you will learn how to recognize bumble bees, what to expect with the bumble bee sting, and how to avoid it. Which one is it - bumble bee or honey bee? Even though insects from the family of bees have many similarities, they also differ in many things. Bees have different habitat, pollination habits, behaviors, and physical characteristics. Honey bees and bumble bees look similar and many people tend to mix them up. Usually, the only encounter with bees is noticing them hanging around flowers but they can also decide to make a nest close to your home which can disturb you and your pets. In order to know how to handle a bees nest, you need to be able to differentiate bumble bees vs honey bees. Bumble bees vary in appearance but generally have round bodies covered in soft hair called pile which is the reason they appear fuzzy. Their body is large and broad with a rounded abdomen tip, while honey bees are smaller and thinner. Honey bee body is covered in many colored stripes, including several grey stripes on the abdomen. Unlike honey bees, bumble bees have only a few stripes of color and usually have part of their body covered in black fur. The colors you can see on a bumble bee are orange, yellow, and/or black. Honey bees have short tongues so they mainly pollinate open flowers, while bumble bees have long tongues. Long tongues enable them to collect nectar even from flowers whose nectar is closed in a tube. Both make a buzzing noise as they fly and have transparent wings, but the honey bee’s flight has a higher-pitched hum. Another very noticeable difference is that honey bees have a clear distinction between head and body, while bumble bees have a “one-piece body”. There is a big difference in how bumble bees and honey bees live. 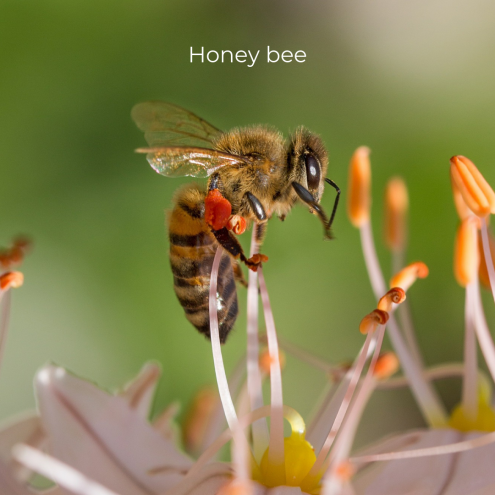 Honey bees are very social and live in colonies that can have tens of thousands of bees, while bumble bee colonies usually have only a few hundred bees. Bumble bee nests can only be found in the wild, while honey bee hives can be wild or domesticated. Wild honey bee nest can be located anywhere from cracks in the wall and hollow trees to bee nests hanging from tree branches. Domesticated honey bee hives are hives kept and cared for by the beekeeper. Bumble bee nest is often found in burrows or holes in the ground. As their name suggests, honey bees produce honey and their colonies survive the winter. A honey bee colony differs from this only if it is weakened due to starvation or illness. Unfortunately, bumble bee colony doesn’t survive the winter and the queen is the only member of the colony surviving winter. She survives the winter by hibernating in the ground. Moreover, bumble bees are not big on producing honey as its enough only for their needs. Like we mentioned, both honey bees and bumble bees can sting. But, do bumble bees sting the same as honey bees? Surprisingly, no. There is a big difference in how honey bees and bumble bees sting. Honey bee stings only once, but bumble bee sting several times. This difference is due to how their stinger is shaped. Honey bee stinger has barbs so it gets stuck in the skin and unfortunately pulls out bee’s intestine when the bee tries to leave. 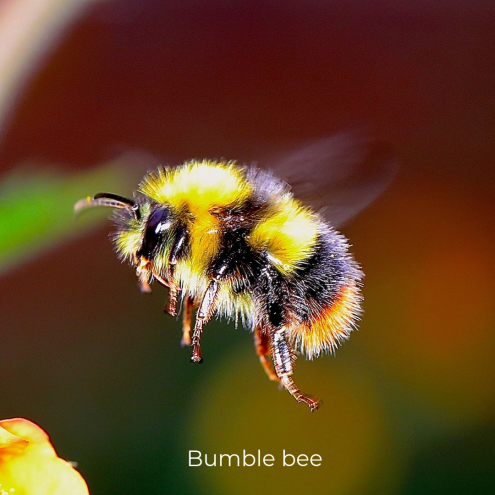 The stinger of a bumble bee is smooth so it doesn’t get stuck, which means that a bumble bee can sting several times. If we take into account the ability to sting multiple times, bumble bees seem more dangerous, but that’s not true. Bumble bees are usually docile and gentle; they have zero interest in stinging people and will attack only if threatened. If the colony is disturbed, it will emit a very loud and angry buzzing sound which usually sends potential threat the other way. Research has been done regarding the painfulness of a bumble bee sting and it has been ranked as less painful than a honey bee sting. Unlike bumble bees, honey bee colony can pose a significant threat due to the number of bees that a colony can have. Even though honey bees are usually docile and won’t attack unless provoked, their attack can be terrifying. If the hive is threatened, honey bees will attack with full force and will pursue their target over long distances. An important difference between a bumble bee and honey bee attack is that bumble bees don’t swarm when attacking so you could still be left with fewer stings than if a honey bee attacks you. When do bumble bees attack? Unlike honey bees, bumble bees are not as defensive and will only attack if truly provoked. Attacks usually occur near the hive because the bee is defending the hive. If you see a bumble bee buzzing around you, it might be attracted to something sugary. 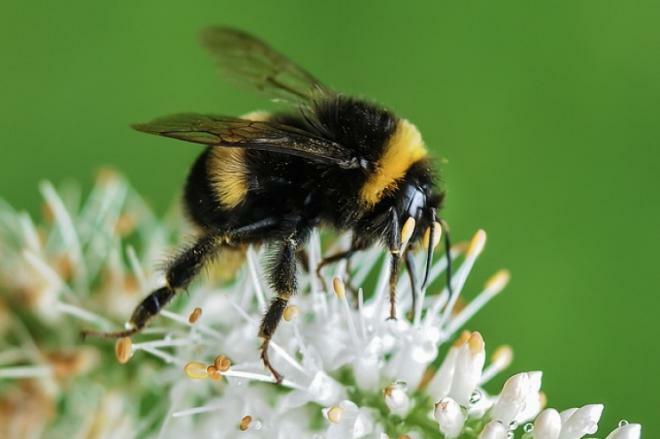 Covering any sugary substances to prevent the bee from sensing them, and moving away from the bee itself is usually enough to prevent a bumble bee sting. However, be aware that some things can make bumble bees aggressive and increase your chances of being stung. Smells such as perspiration, perfumes, aftershave, scented soaps, and alcohol can make bumble bees aggressive. Also, jewelry such as rings and bracelets can cause bumble bee aggression due to the scent of oxidized material between the jewelry and the skin. If you love wearing blue colored clothing, bumble bees might be more aggressive toward you. If you will be in the area where bumble bees might be hanging out, it’s good to avoid blue clothes and keep artificial scents at a minimum. Bumble bees can sting through clothing so it’s not a pleasant experience. Since we already answered the question on how do bumble bees sting, you should also know what happens after the bumble bee sting. We already mentioned that a bumble bee’s stinger is different than a honey bee’s stinger; bumble bee stinger doesn’t have barbs. As a result, bumble bees can sting multiple times at once and possibly cause more harm than a honey bee. However, the reaction to their sting is similar and usually will pass within a few hours after the sting. Firstly, both stings are painful, but a bumble bee sting is probably more manageable as it is less painful than a honey bee sting. A typical reaction to bee venom is itchiness, swelling, and redness at the site of the sting which can last several hours. These symptoms can occur right after the sting but usually occur several hours later. A similarity between a honey bee and bumble bee sting is that both can cause an allergic reaction. In general, a reaction to honey bee or bumble bee sting is local and non-allergic, but in rare cases the reaction can be dangerous. When you are stung, the bee venom gets injected into your body so your body tries to fight it by creating antibodies. This is a normal body’s response to foreign substances which also helps in keeping us healthy by fighting viruses and bacteria which can make us ill. Since an allergic reaction to bee venom involves antibodies formed during the first sting, it’s impossible to get an allergic reaction after the first sting. The symptoms of a bee venom allergy become evident soon after the sting (a few seconds to half an hour after the sting) so be sure to pay attention to how you feel. The severity of an allergic reaction depends on the amount of venom injected so multiple stings can be more dangerous. Medical treatment is usually not necessary, but some measures can be taken to minimize the local reaction. However, how do bumble bees sting you is important when deciding on what to do. If you have been stung in a sensitive area such as near the eyes, you should take an anti-inflammatory such as ibuprofen or aspirin as soon as possible. Moreover, putting a cold compress to the area should help reduce the swelling and anti-itch ointments can help with itchiness. Within several hours a local reaction usually reduces and you can continue with your day. As you can see local reactions are usually pretty harmless, but be careful with stings in the mouth or pharynx as the swelling can close your airways. Going to a hospital for such possibly life-threatening stings is essential. In case of an allergic reaction, the approach is a bit different. Level one reaction to the sting can progress further so it’s a good idea to contact your doctor who will decide what to do next. Your doctor might want to keep you the hospital to be able to monitor your condition. If you start vomiting or get level three or four symptoms, you should be taken to a hospital immediately. A doctor can administrate you a prescription-strength antihistamine which is useful for an allergic reaction because it reduces the swelling caused by the histamine in the bee venom. In case you get a level three or four symptoms, firstly you need to get adrenaline which opens the airways, constricts blood vessels, and stimulates the heart. People who had a strong allergic reaction in the past might already have adrenaline with them in the form of an adrenaline auto-injector (such as Jext or EpiPen). In case you notice any symptoms of an allergic reaction, you have to react fast as it can save your life. The best way is to avoid bumble bee nests. Their nests can be made in the ground, in nests abandoned by small animals like mice or in loose grass clippings. The most obvious sign that a bumble bee nest might be near is the sight of bumble bees buzzing just above the ground. However, sometimes we might not notice the warning signs and could stumble upon the nest. If you are already close to the nest, you should stay calm so you don't provoke the bees. The chance of being stung can be reduced by avoiding making them aggressive or provoking them. You should not swat at the bumble bees, wave your arms or bump into their nest. Just move away slowly and carefully, and you should be fine. If you have a nest near your house, and you would like to get rid of the bumble bees, you should clear away possible habitat spaces. You should clear away brush and grass piles and keep the ground well watered. Wet ground is not stable so that should prevent the bees from building underground nests. Also, keep the trash inaccessible as it often has sweet and sticky substances that will attract bumble bees if they can sense it. Do bumble bees sting - yes, should you be afraid of them - no. Like we mentioned before, bumble bees are not aggressive as honey bees and usually won’t attack unless you disturb the nest or the bumble bee itself. Since bumble bees don’t swarm like honey bees when they feel threatened, you have a pretty good chance of not getting stung by a bumble bee. Unless you are allergic to bee venom, hosting bumble bees in your backyard is safe and you don’t need to fear of planting wildflowers which attract bees. The only mission of a bumble bee colony is pollination so you don’t have to worry if you see a few bumble bees here and there. You can just leave the bumble bees to do their thing and you will have a wonderful garden in no time, full of colorful flowers. If you decide on welcoming bees to your garden, we have a few tips on how to do it here and here. Everyone loves a beautiful garden, but even greater importance of a bee friendly garden is that you are helping in saving these precious creatures. Lately bees are in trouble and could really use our help.